Arsenal beat Chelsea to keep tensions down, but in the Premier League crisis comes for everyone eventually. Hello, and welcome to Tactically Naive, brought to you this week by Broken Laptop Charger Sockets, and the Lovely People Who Fix Them. Friends, we need to talk about Arsenal. Let’s begin with a general theory of the Premier League. Thanks to the hyperactive, overclocked, and extremely online nature of the thing, all the clubs involved exist in one of two states: Crisis, and Pre-Crisis. Crisis you’ll be familiar with. Losing games. Or, for big clubs with big ideas, winning games but not very well. The manager frustrated with the players; the players disaffected with the manager; the fans and the boardroom united in despair at the league position. When it comes to Arsenal, this means booing at the Emirates, laminated A4 signs, and viral videos of angry men shouting at one another about Hector Bellerin. Pre-Crisis is a little trickier to pin down, since much of it only comes into focus once Crisis kicks off properly. But then, perhaps, we don’t need to define it too precisely. It’s all the things that happen, and all the things that don’t happen. All the things that, by their occurrence or not, could in the fullness of time bring about proper, full-blown, broken-crest-on-the-back-pages Crisis. Or to put it another way: everything. And this season, nobody is storing up Pre-Crisis energy like Arsenal. The entire club is aquiver with explosive potential. The defence is a mess, and the midfield is a nice idea. Mesut Ozil is being paid to play Fortnite, while Aaron Ramsey is heading off somewhere much more sensible. There are strange rumblings off the field as well: Sven Mislintat, brought in to reproduce Borussia Dortmund’s transfer brilliance, is leaving after just over a year. This is all exacerbated by Arsene Wenger and the timing of his departure. Of course, the great man had every right to stay as long he liked: when the club have changed their name to honour you, there’s no need to go rushing out of the door. But the fact that he stayed for so long past the peak of his effectiveness, and left the club as much punchline as powerhouse, means that any patience Unai Emery might have assumed he had was spent long ago. Unfair? Perhaps. But such is life. There’s only so much transition a club can take before, well, Crisis. All of which means that they should be a mess … and yet, somehow, they’re not. Not quite. They’re almost there: smoke is trickling from the mountain top, the ground is shuddering underfoot, and everybody’s checking to make sure their dogs are near at hand. But every time the explosion threatens to come, it gets delayed again. Last weekend they lost to West Ham in miserable fashion, and the Mislintat news broke, and “Chelsea (H)” loomed up big and ominous. Here come the boos, the glorious boos. Right? Wrong. 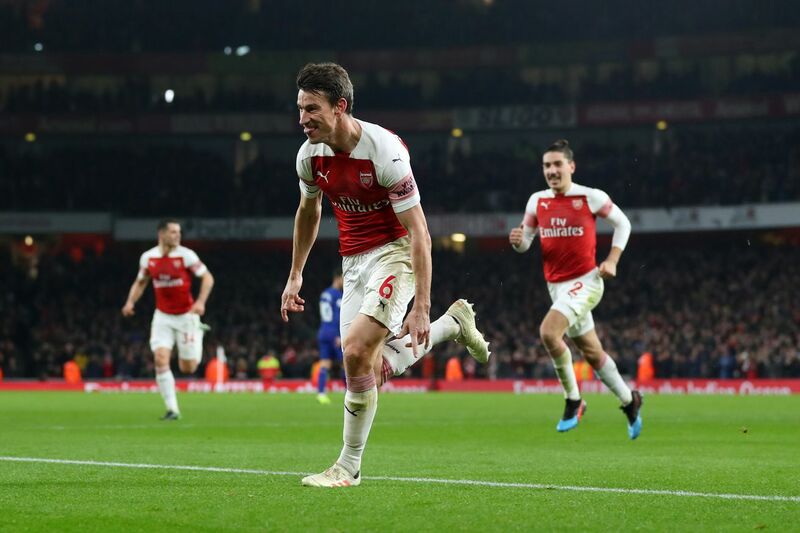 Chelsea were rubbish, Arsenal were efficient in the first half and comfortable in the second, and so everything has simmered down again, just a little. As with the victory over Spurs, Emery and his players have bought themselves another month or so of Pre-Crisis. Perhaps this is how success at post-Wenger Arsenal is going to have to go. If they can ride out the bumps, stave off the moments of total catastrophe, and keep bouncing along the edge of disaster without ever actually collapsing into it, then Emery and his team might just get the time to do … well, whatever it is that they are trying to do. Manchester United has reinforced the brutal logic of the very top of this season’s Premier League: six into four simply does not go. Even with the Europa League, somebody’s ending the season in Crisis. But for the moment, it isn’t Arsenal. Not yet. Crisis hasn’t been defeated, of course. It can never be defeated. But it’s been delayed for the moment, and so everybody at the Emirates can look forward to a blessed period of peace until the next big game, which is … oh, Manchester United on Friday in the FA Cup. Wow. This Crisis guy is persistent.